"Evelyn Waugh once suggested that the term "architectural" was preferable to "creative" for describing writers because "what makes a writer, as distinct from a clever and cultured man who can write, is an added energy and breadth of vision which enables him to conceive and complete a structure."" Inversely then, does a work of architecture comprise, or is a work of architecture capable of comprising the characteristics of a novel? I suppose that question right there sums up the rudiments of the investigation itself. 2001 In the evening I saw Robert Venturi, Denise Scott Brown, Rem Koolhaas, Michael Sorkin and some others all on the same stage. I had never seem Koolhaas in person before, and his 'performance' last night did not make a good impression. He was pissed off about something, and he let everyone know he was pissed off, but he didn't really say why he was pissed off. I just looked up the words delirious and delirium in the dictionary, and many aspects of the definitions do in fact describe Rem Koolhaas's behavior in New York last night. He did display aspects of a wandering mind at times. He didn't so much seem confused, but the moving podium he spoke from did provide a sense of disorientation. His 'speech' was kind of disordered, but not as much as his notes seemed to be. There was a definite restlessness (and when he deliberately moved his seat away from Venturi and more towards the center stage, maybe that was a beginning sign of delusion of hallucination). As to excitement, if it was there, then it was much subdued. Perhaps what I really witnessed last night was a live enactment of Delirious New York, oddly starring Philadelphians (Venturi and Scott Brown), with a guest appearance by the quondam 'screen writer' (Koolhaas), and a very impassioned soliloquy by one very real New Yorker (Michael Sorkin). Yoshimura Junzoo, Shofu-so (Nagoya/New York City/Philadelphia: American Japan Society of Tokyo, 1953-57). 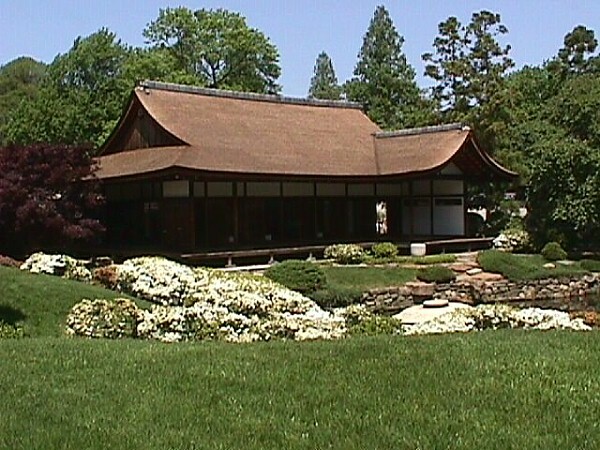 2002 This 16th century style Shofu-so (Pine Breeze Villa) was constructed at Nagoya, Japan in 1953, then disassembled and shipped to New York City for exhibit within MoMA's sculpture garden in 1954, then disassembled again and shipped to Philadelphia's Fairmount Park. The "Japanese House and Garden" now within Fairmount Park really is a moving architecture, not just literally moving, but even more so a 'spiritually moving' place. One can't help but feel transported when there. The garden is especially beautiful in early May when the many azalea bushes are in bloom. When I first visited the house in 1975 it was one of those places (in Philadelphia) that was rarely visited. There was a young 'hippie-ish' tour guide 'working' there then, and he admitted to spending most of his time there completely alone. He said he loved it though, especially on rainy days because that's when he opened up the entire wall of the house that faced the lake/pond in the garden, and that's when he sat in the middle of the main room's floor "taking it all in." 2009 Presently, I like to design delivery of content in the enfilade slash labyrinth style. Perhaps, someday, I'll design some delivery of content following the architecturale promenade formula. Actually, I've been struggling with a big design/renovation brief, the solution to which has been eluding me for well over a month now. Alas, today, while just stepping out of the shower, it finally dawned on me--delivery of content in the enfilade slash labyrinth style via bilocation. Is subtext actually text bilocated? Being the only car around driving through the completely unattended 'Iron Curtain' checkpoint between East and West Germany at Erfurt, May 16, 1990, was not only exotic (strikingly unusual or strange in effect or appearance), it was down-right eerie (uncanny, so as to inspire superstitious fear). however... 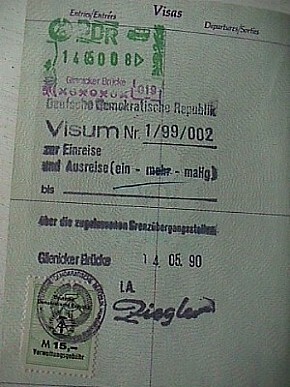 Crossing the Glienicke Bridge (where spies were traded during the Cold War), 14 May 1990, was actually a bit thrilling. The quotation above regarding Waugh begins a chapeter entitled "Prologue: Laying the Foundations," and perhaps the chronological passages above outline a new prologue.